i have been a fan of botkier for a very long time. i remember when their product line was one item - the trigger bag. it came in three different sizes and had roots deeply entrenched in photography. since then they have blossomed in to an all out fashion accessories line. i won't say i didn't have my doubts. their first line of shoes seemed a bit off to me, and for a while there the handbags were more flash and less function. 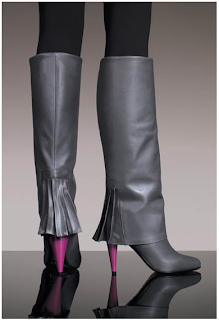 however, i have just witnessed the most amazing pair of boots (available here) ... possibly ever. well the most amazing pair of non-flat boots ever. i have a ridiculous soft spot for the loeffler randall matilde flat wedge boot, but that is for another day.